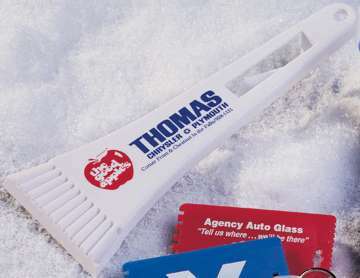 Inexpensive Wholesale Personalized Ice Scrapers Custom Printed or Blank. Promotional, Lowest prices in USA and Canada. Very Sturdy, High Impact Polystyrene Material. 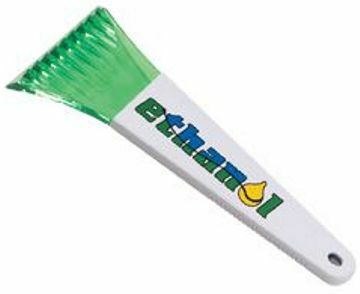 COLORS: Matte White; add $0.10 per scraper for Glossy White scrapers. Basic unit prices below are for 1-color imprint on matte white scrapers. We also supply glossy white scrapers for $0.10 more per scraper. Contact us if you require extra imprint colors. Free artwork design. Grip Side Imprint Area: 2 5/8" x 1 3/4" to 1 3/8"
Flat Side Imprint Area: 5 1/2" x 1 3/4" to 3/4"
Blade Imprint Area: 1 3/4" x 3/4"
Basic unit prices below are for 1-color imprint in one location. Add the amount shown for each extra color.